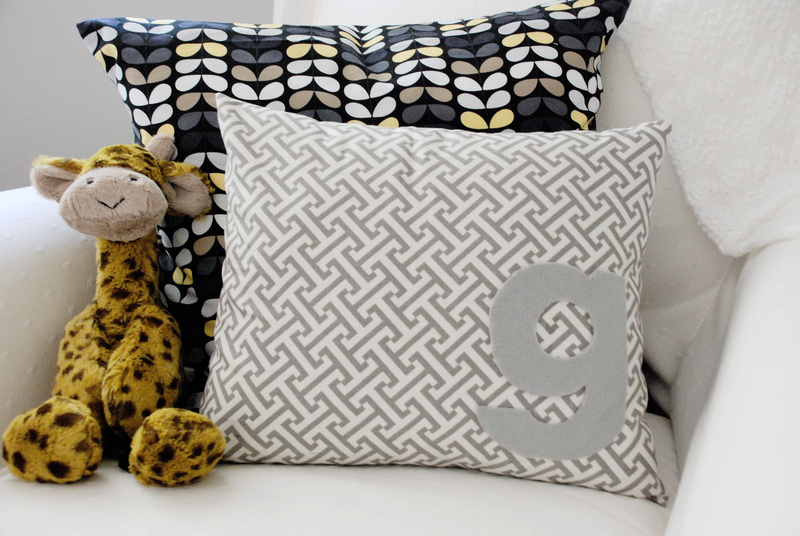 When I started designing baby G's nursery I considered just a few DIY details. But as I searched for things I wanted to include in the nursery, I realized I didn't like most of what I found or, if I liked it, it was way too expensive. I then started to consider making some of these things myself. By no way am I an expert crafter or sewer but I thought being an architect I have some skills I could put to good use. 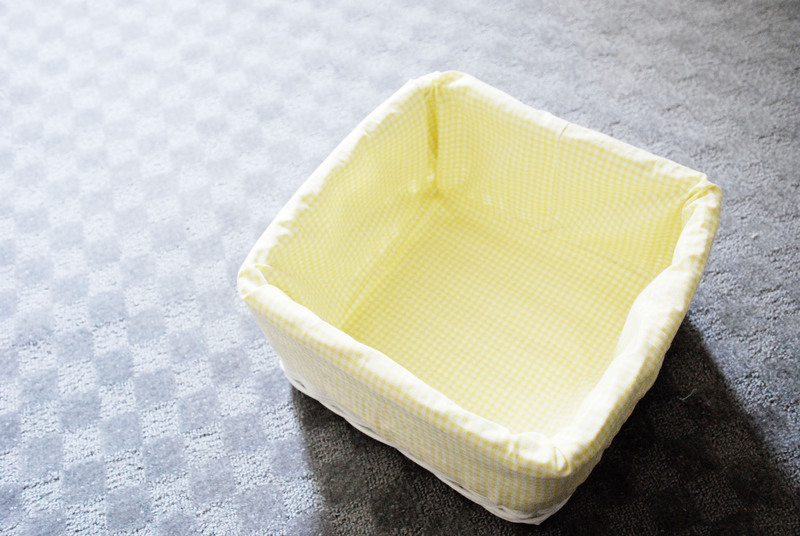 Basket liners: We had the Pottery Barn basket liners in green from L's changing table. Unfortunately they didn't go with our grey/yellow color scheme. I had to either buy new ones (I couldn't find any) or make them. With that on mind I got some Gingham fabric in yellow and looked online for a tutorial. I didn't find any easy enough to follow (I should say I'm not that good at following directions or steps). So what to do? I took a good look at the green ones we had, got an idea of how they were sewed and ventured into trying to do one myself. Not bad, right? Crib skirt: I searched for months for a crib skirt in yellow or grey that I like and found nothing. So I started looking at some baby blogs and came across different tutorials to sew one. Some tutorials didn't even include a sewing machine. That gave me the confidence to attempt to sew my own. I think it came out pretty good. Window valance: Sewing this was pretty easy. 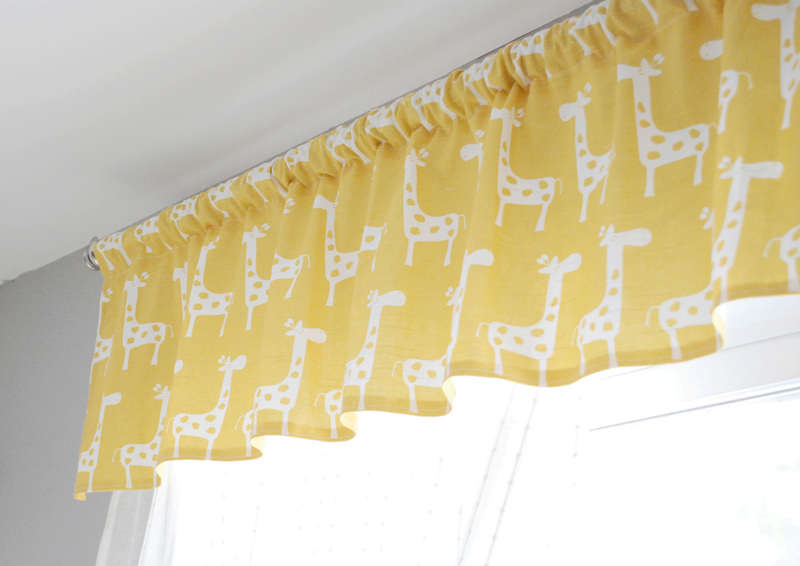 I already sewed some little curtains for my kitchen last year so it was the same process. We are talking simple-rod-casing curtains. No ruffles, nothing fancy. I used a wider piece of fabric than the window width so it can ruffle a little. Changing pad cover: I was surprised by how easy this project was. 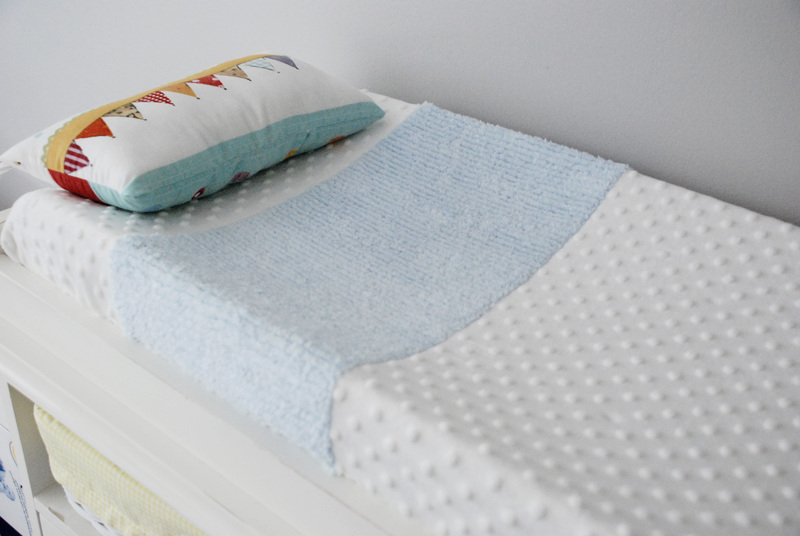 This time I followed this great tutorial and in less than 60 minutes (no kidding) I had a new, cute changing pad cover for the changing table. I used some white Minky fabric and a piece of blue Chenille fabric I'd bought at JoAnns. Pillows and pillow covers: I had some fabrics in grey and yellow that I bought some time ago (from Ikea, Etsy & Fabric.com) so I decided to sew some envelope-type pillow covers. I also did some little pillows for the crib and changing table. And since I wanted a monogram pillow, I added a felt "g" to one of the covers. I just glued it with some fabric glue but I think next time I should sew the letter to the cover to make it look more professional. These are the little DIY sewing projects for the nursery. For being my first time, I'm very happy with the results. I'm planning on sewing some bibs and a "blankie" for baby G, too. I think sewing will be my new hobby for now on. Oh my goodness I love it all! I'm really wanting to make a trip to my local fabric stores now! What a great way to personalize a room and not spend a ton of money! Great job sis!! Love everything! Can´t wait to see baby G´s room! I love it all! You did such a great job. ACK! I don't know why that showed my whole name. We don't want that. But I love what you've done. It all looks so cute! Everything is lovely. You are so talented. hi! 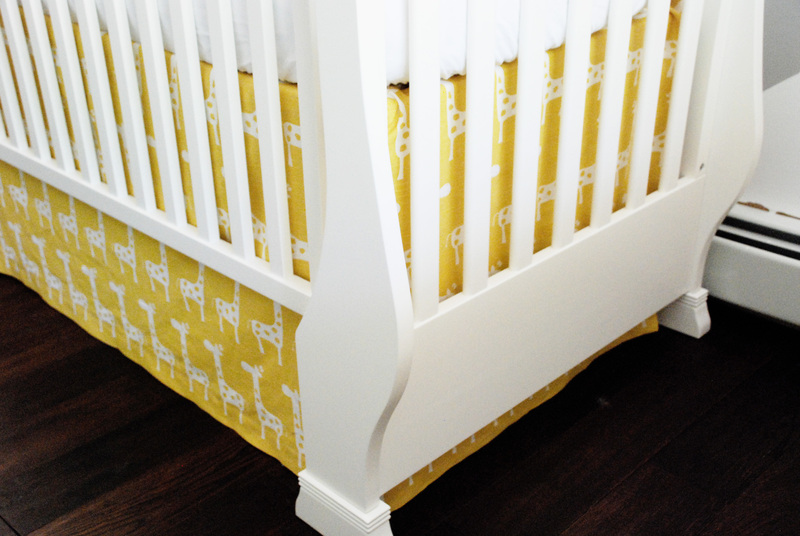 i was wondering if you could share some of the DIY crib bedskirt tutorials that you found? I have never sewed in my life but would be willing to try to get something as cute and custom as yours! thanks! Love love love your nursery. Especially the zigzag wall. Anyway thanks so much for linking to my changing pad tutorial and I am so glad that it worked for you! Thanks for taking the time to share :) Oh - just a thought for the monogram pillow, I did the same almost exact thing but I used lite steam-a-seam which is usually used for applique but it is permanent stabilizer that pretty much acts like a glue and works really well, I used it with a felt letter onto a canvas cotton. can you share the tutorial on how to make the crib bedding skirt? Thanks!